Warlords: Crystals of Power slots is a well-thought slot created to depict a war-like theme. The gameplay, symbols and soundtrack are all in line with the theme of the slot game. The backdrop is created with a black battle theme. It is quite popular as it has a large number of free spins offered. This ensures that the player would not just stop spinning the reels. NetEnt Gaming is a gaming software developer for over 2 decades since 1996. The company has created a wide variety of different theme-based slots. The high definition graphics and animations in their slot have clearly helped to maintain an outstanding reputation of the developer among the casino operators. The company has offices in many countries around the world. 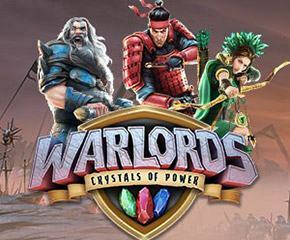 The slot game Warlords: Crystals of Power has 5 reels and 30 paylines. It is mainly played with the three symbols of power. These are the Samurai, the Priestess, and the Barbarian ruler. Their symbols appear stacked on the reels. The other symbols are mainly the animal symbols. The crystals of power symbol is the wild and it can substitute all the other symbols except the scatter and the bonus symbols. Moreover, they offer a 20x multiplier. Among the bonus features of this slots are the 3 set of free spins offered to the player. 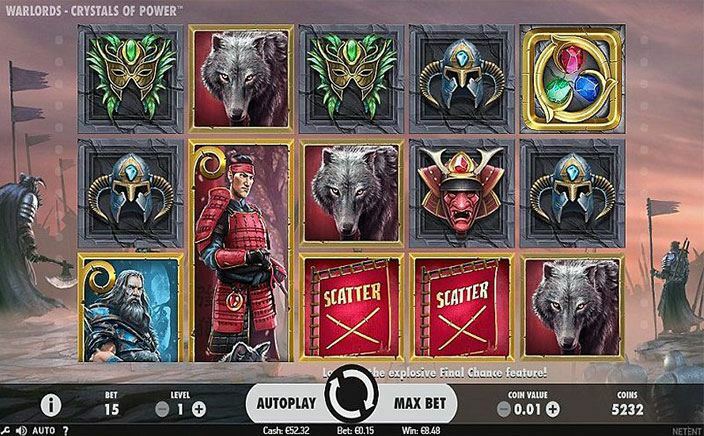 These are Barbarian, Priestess, and Samurai Free Spins feature. Each of them offers 9, 5, and 7 free spins respectively to the player if you get at least 3 of them on the winning payline. Obtaining 3 different scatters, however, activates the battle making winning scatters sticky on the reels. Then there are re-spins offered and again obtaining the similar pattern of scatters can also yield the Final Chance feature. This feature instantly awards you a cash prize up to 100 times your bet amount. Then there is a Random Overlay Wild feature. Here any of the three symbols of Barbarian hammer, a Priestess arrow or a Samurai sword are randomly offered to you showering wilds to you to form winning paylines easily. Warlords: Crystals of Power slots, no doubt sounds complicated with respect to the features, but it proves to be an out an out entertainment to the players worldwide. The slot is expected to attract its players due to the different kind of experience it has to offer.